Whether you need a boardroom for eight, an auditorium for 500, or a beautiful reception ballroom, the Fawcett Event Center can accommodate the guests at your next conference or event. 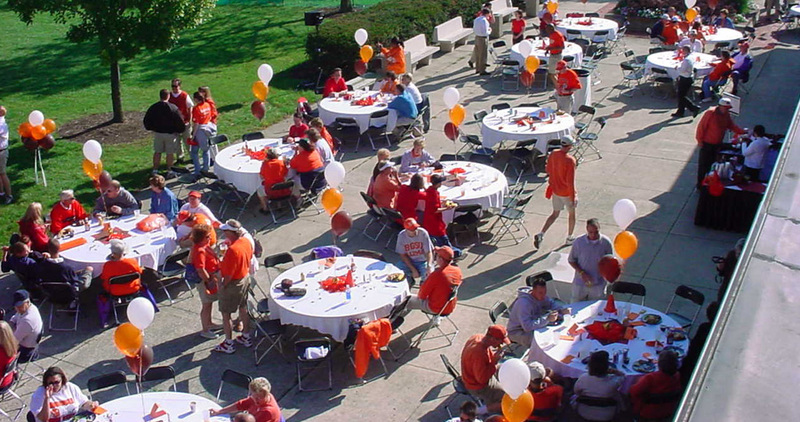 Located on the perimeter of the Ohio State campus, the center has a unique atmosphere and a tradition of exceptional, personalized service. The executive chef and on-site catering team provide an extensive, creative food and beverage menu. The Fawcett Event Center delivers professional meeting, banquet, and reception services with a personalized touch. The Fawcett Event Center is staffed with professional planners to assist in every detail of your event, plus hotels, transportation, tours, and the use of other campus facilities. The Fawcett Café is a quick service outlet serving specialty coffee beverages, snacks, salads and sandwiches. Newly-remodeled ballroom seats up to 300 guests and offers specialty colored lighting features, natural light and attached patio. On-site catering includes snacks and receptions, elegant multi-course meals, tailgate parties, wedding receptions, Mitzvahs and full bar service. Small meeting packages and Wedding Reception packages available.